Now it’s President Donald Trump’s turn to pull off the ultimate charm offensive. Wined and dined on multiple state visits during his tour of Asia last year, Trump is paying it forward and celebrating nearly 250 years of U.S.-French relations by playing host to President Emmanuel Macron at a glitzy White House state dinner on Tuesday. Months in the making, it’s the first state visit and first big soiree of the Trump era in Washington. “It sounds like what they’re planning will be spectacular,” said Jeremy Bernard, who was White House social secretary in 2014, the last time the U.S. feted a French president. The White House has said little beyond the fact that dinner will be served, sticking to the tradition of trying to maintain an element of surprise for its guests. In fact, Macron will break bread twice with Trump. On Monday, the president and Melania Trump will dine privately with Macron and his wife, Brigitte, at Mount Vernon, the home of America’s first president, George Washington, on the banks of the Potomac River in Virginia. 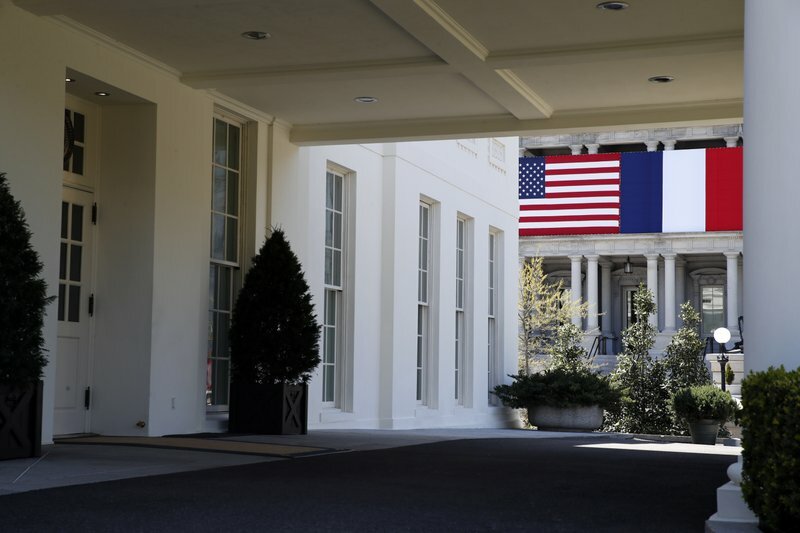 The White House said the setting will serve as a reminder of France’s “unique status” as America’s first ally. Trump ended his first year without receiving a foreign leader on a state visit, making him the first president in nearly 100 years to do so and heightening the stakes for Tuesday. Dinner tickets are typically highly sought after by Washington’s political and business elite. A few inklings of who’s in and who’s out already are known: Christine Lagarde, head of the International Monetary Fund, is in, as are House Speaker Paul Ryan, R-Wis., and Defense Secretary Jim Mattis. Senate Republican Leader Mitch McConnell of Kentucky was invited, but his office said he is unable to attend. In a break with tradition, Trump invited no Democratic members of Congress or journalists, said a White House official who was not authorized to discuss the arrangements. But at least one Democrat will be in the crowd: the office of Louisiana Gov. John Bel Edwards confirmed his attendance. Approximately 150 guests will take their seats in the State Dining Room on Tuesday, making for a more intimate affair than those held by President Barack Obama. Obama’s guest lists numbered into the hundreds, requiring that the event be held in a tented pavilion erected on the South Lawn because no room in the White House can accommodate that many people. Most of the responsibility for executing a flawless celebration falls to the first lady and her staff, including such key details as what is served (Trump likes wedge salads and chocolate cake) and poured into glasses (Trump wine? ), who sits next to whom, who performs after dinner and what the decor looks like. One big moment is the first glimpse of the first lady in her gown. Fashion details are kept secret until the first couple steps on to the North Portico on Tuesday night to welcome their dinner guests. Former first lady Michelle Obama often used state dinners to showcase the talent of up-and-coming designers. Some designers have cited Trump’s politics in refusing to dress the current first lady, a former model. Still, a likely choice would be Dior, the French design house whose fashions Mrs. Trump often wears, or Herve Pierre, the French-American who designed her inaugural gown and other looks. The last time a Republican president hosted his French counterpart was November 2007 when President George W. Bush welcomed the newly divorced Nicolas Sarkozy. More than 100 guests feasted on lobster bisque, lamb with tomato fondue, green beans and sweet potato casserole, salad and dessert served in the State Dining Room. Among the guests were major league baseball pitcher Tom Glavine, Supreme Court Justice Stephen Breyer, French chef Guy Savoy and several Louisiana politicians. After dinner, guests strolled down the hall to the East Room to watch performers in the roles of Washington and the Marquis de Lafayette, the Frenchman who served on Washington’s staff in the Continental Army. Sarkozy toured Mount Vernon the following day. When Macron’s limousine first pulls up the White House driveway on Tuesday morning, Trump, the first lady, White House and administration officials, and hundreds of invited guests will be waiting on the South Lawn. The pomp-filled arrival ceremony is for the man who became the youngest president in French history when he was elected in 2017 at age 39 on his first run for office. The visit also offers Macron his first Oval Office meeting and a joint White House news conference with Trump. There’s also a State Department lunch hosted by Vice President Mike Pence before Macron and his wife arrive for the state dinner. The Trump-Macron relationship appeared to get off to a bumpy start with a white-knuckler of a handshake when the political novices met for the first time at a NATO summit in Brussels last May. But Macron likely sealed the bond after Trump accepted his invitation to attend the annual Bastille Day military parade in the center of Paris in July. Macron and his wife also took Trump and the first lady on a tour of Napoleon’s tomb and whisked them up into the Eiffel Tower for dinner overlooking the City of Light. The experience led Trump to order up a military parade for downtown Washington later this year. But the two part company on some significant issues, including the Paris climate accord, which Trump withdrew the U.S. from last year, and the Iran-nuclear deal, another multinational agreement that Trump is itching to pull out of. The president did successfully rally Macron and British Prime Minister Theresa May, with whom Trump has sparred, to mount a joint military operation against Syria in response to an apparent chemical attack this month that killed Syrian civilians. Macron still worries about Trump’s desire to remove U.S. troops from Syria. Discerning his tastes, including likes and dislikes, even allergies, is one of the first things the White House tries to pin down for all guests, said Bernard. “You’re really focused on making sure the guest feels special,” he said. Mrs. Trump’s social secretary, Rickie Niceta, came aboard last year after two decades of event planning for a caterer whose clients included the White House, the State Department and several embassies, in addition to working on the past five presidential inaugurations, including Trump’s. The first lady, who speaks French, also has experienced hands running the kitchen, pastry shop and florist’s lair. All three women helped execute more than a dozen state dinners for Obama. Trump owns hotels, including one near the White House, and knows about good hospitality. Bernard recalled that, just as invitations were about to go out for the 2014 dinner for then-French President Francois Hollande, news broke that Hollande and his longtime girlfriend had abruptly split. Mrs. Obama’s staff anxiously sought clarity on whether Hollande would bring another date. He didn’t, and Bernard dealt with the awkwardness of the situation by seating Hollande between the two Obamas. Associated Press writer Sylvie Corbet in Paris and AP News Researcher Randy Herschaft in New York contributed to this report.